Abu Dhabi. 09 March 2017.While the world is expecting a slight dip in the market worldwide and relatively flat growth in the Middle East in 2017, with stronger growth not coming until after 2018, Embraer is still hopeful of a steady growth in the already stable Middle-East market for itself. 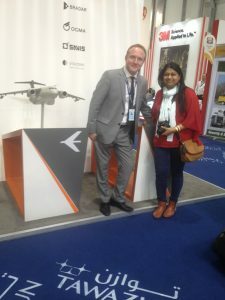 Guy Douglas, Director Corporate Communications EMEA, in an exclusive interview with Chaitali Bag, Chief of Bureau,ADU was optimistic about the qualities of KC-390 and A-29 Super Tucano which will make them the most sought after in the region. ADU. Please elaborate on the market middle east is for Embraer? What is the size of existing business Embraer does in the region? Emb. Embraer has a number of customers in the Middle East across all our businesses – airlines operate our commercial aircraft where Embraer dominates the 70-130 seat segment. Our executive jets are enjoyed by individual owners, companies and charter operators, as well as being used by Etihad Airways and Emirates to train their student pilots at their respective flying colleges. There are also a number of air forces operating our aircraft for Defense missions in Middle East. ADU. How has been the response at IDEX 2017 for the company? Is it up to your expectations? Emb. We’ve been very pleased with the response we have received at IDEX and in the region as a whole. ADU. 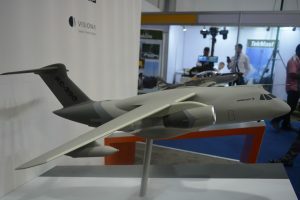 What is the opportunity for KC-390 in the region? Emb. There are significant opportunities for our new generation multi-mission transport aircraft, the KC-390, in the region, and we have received considerable interest. The KC-390 is capable of carrying up to 26 metric tons of cargo at a maximum speed of 470 knots (870 km/h), with the ability to operate in harsh environments, including unpaved or damaged runways. The aircraft takes more payload, faster to anywhere you need to go, and is considerably more flexible, while being less expensive to operate and maintain than legacy aircraft. This new aircraft is a true force multiplier for any nation. The KC-390 can perform a variety of missions: cargo and troop transport, cargo and paratroopers airdrop, aerial refuelling, search and rescue, medical evacuation, disaster relief and aerial fire fighting. ADU. Do you think Super Tucano is the product which will be most appropriate for the region? Emb. The A-29 Super Tucano is the best advanced trainer and light attack turboprop aircraft available, selected by 13 air forces worldwide, and is already operating in the region. The aircraft was selected by the U.S. Air Force for its Light Air Support program and is currently providing close air support in Afghanistan. Unlike other aircraft, the A-29 Super Tucano concept and design was not adapted from a trainer or crop-duster platform. It is a clean-sheet design dedicated to close air support missions. After more than ten years in action, the Super Tucano has gained an excellent performance record: over 270,000 flight hours and 35,000 combat hours. It offers more than 150 proven and operational weaponry configurations. ADU. Are there any plans to offer both these aircraft to India? Emb. 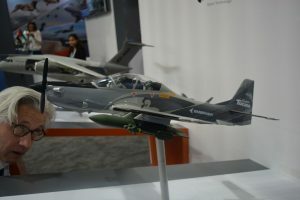 India is a very important market for Embraer Defense & Security. We have had a very fruitful cooperation with India and we will continue to look for other opportunities of cooperation. However we do not elaborate on business possibilities. ADU. How many EMB 145 AEW&C are on order in the Middle East? EMB. We do not disclose this information. ADU. What is India’s demand for these? Emb. This is a question for the Indian Government and/or the Indian Air Force. Mohammad Bibaoune, Executive Director Egypt, Naval Group In A Monologue Interview With Chaitali Bag, Chief of Bureau, ADU At EDEX 2018. (Transcribed Interview).